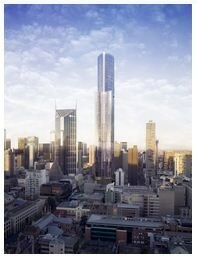 Otis Elevator Company Pty Ltd (Otis Australia) will provide 22 elevators and escalators to the Aurora Melbourne Central. When completed, the building will stand approximately 270 meters in height, making it the tallest residential building in Melbourne's central business district. Otis, the world's largest manufacturer and maintainer of people-moving products, including elevators, escalators and moving walkways, is a unit of United Technologies Corp.
Aurora Melbourne Central is developed by Malaysia-based UEM Sunrise and designed by Elenberg Fraser. Construction will be undertaken by Probuild, one of Australia's largest and most successful construction firms, which was founded in 1987. Otis Australia will install nine high-speed, high-rise passenger elevators including four Elevonic® elevators and five Skyrise™ elevators, as well as 11 Gen2® Premier units and two heavy-duty escalators. Three of the Gen2 Premier elevators will come equipped with the CompassPlus™ destination management system, which acts as a virtual concierge, directing passengers to the best elevator to reach their desired floor, reducing wait and travel time. "We are delighted to provide elevators and escalators for Melbourne's tallest residential building and are glad to have a strong business relationship with this important builder," said Ken Muller, president, Otis Australasia. "We hope to see our Skyrise™ and CompassPlus™ products continue to gain momentum in Australia." For more information, visit www.otis.com or follow Otis on Twitter @OtisElevatorCo.